The Doña Ana Sphere straddles the area in southern New Mexico from Paso to north of Las Cruces. The people who settled in this region left us a rich legacy. Under extreme conditions, they managed to create and re-create villages for their families and others. It was a very complicated time, and they fashioned a complicated peace. Their experiences, strategies and tactics are still relevant today. 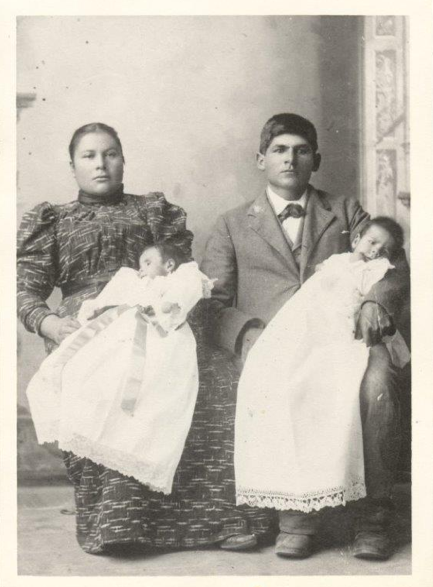 Above: Epifania Rivera Apodaca and Francisco Gonzalez, with their twins, in Doña Ana, New Mexico. Epifania’s and Francisco’s parents were born in Senecú and Paso. Photo courtesy of Emilio Ralph Gonzalez. The Civilians of Doña Ana Sphere. Historically, the Village of Doña Ana in New Mexico is one of the most important villages in North America. The United States Army invaded the village in 1846 and occupied it for several years during and after the U.S War on Mexico. As such, the village became a focal point of tension between the Republic of Mexico and the United States. The villagers of Doña Ana were mostly poor. They were also relatively experienced with issues of violence and intra-community tension. For them, the U.S. Army presented yet another obstacle to carefully surmount, absorb or reject. Based on preliminary research, many of the villagers of Doña Ana were descendants of those who fled the violence of the Pueblo Revolt of 1680. Although the revolt has been described as a set of coordinated attacks by various indigenous Pueblo Indians against Spanish colonists, most of those affected by the revolt were people of indigenous descent. During the revolt, numerous families fled south to Paso del Norte from various locations in New Mexico. These exiles established five pueblos within the larger Paso district: Paso, Senecú del Sur, Socorro del Sur, Ysleta del Sur, and San Lorenzo del Real. These pueblos were essentially reconstituted communities. In 1744, the approximate percentage of indigenous people living in the pueblos of Paso, San Lorenzo, Senecú, Ysleta and Socorro was 19%, 80%, 93%, 100% and 91%, respectively. When considering those of “mestizo” or mixed Indigenous-Spanish background, the percentage of persons of indigenous background living at the pueblo at Paso itself was much higher. By 1751, certain land in Paso was assigned in perpetuity to the indigenous, with prohibitions against selling or transferring. Most of the civilians in the Paso jurisdiction engaged in agricultural activities. Indigenous Warfare. As evidenced in colonial records, Spanish colonial authorities recognized that the northern “frontier” of Nueva España was indigenous space. Spanish maps, for example, marked off enormous swaths of land for indigenous groups referred to as Apache, Comanche, Navajo and others. For over two hundred years, various Apache groups subjected the pueblos of the Paso jurisdiction (and other areas) to violent attacks. All the while, Apaches were absorbed into the Paso community voluntarily and involuntarily. At times, small groups of Apaches made peace overtures and settled within the Paso jurisdiction. Others were captured, imprisoned and/or forced into servitude. For the most part, the relationship between the people of Paso, on the one hand, and the Apaches and Comanches, on the other, remained one of constant warfare. In the historiography, this warfare has traditionally been described as Spanish versus Apache. But when considering the large percentage of persons of indigenous descent living within the Paso district, this warfare is more accurately described as inter-indigenous warfare. Each pueblo of Paso had its own civilian guard (militia) to defend against Apache attacks. The indigenous war captains of Senecú, for example, had the responsibility to organize the defense of their pueblo. Floods. The Rio Grande (or the Río Bravo) was the principal river that flowed through New Mexico, from north to south. In Paso, it was a source of life and occasional devastation. The banks of the Rio Grande often swelled with the late Spring rains. A dam had been constructed in 1766 to assist with flood control. However, the force of the river changing its course could not be contained. In 1828, the Paso jurisdiction suffered a particularly disastrous flood. Floods also occurred in the early 1830s and into the 1850s, as the Rio Grande changed course at various locations. Due to the floods, land for habitation and agriculture became scarce, which prompted inter-community migration. Based on preliminary social mapping, many families from San Lorenzo, for example, moved to Senecú. Families from Chamizal also migrated within the Paso area. The pueblos of Ysleta and Socorro were surrounded by flood water, which made migration difficult. This inter-community migration in Paso created significant tension, particularly because land for agriculture was limited. Based on preliminary research, many disputes arising from the floods were heard by local authorities. Each pueblo in Paso had a Juez de Paz (Justice of the Peace) and an Alternate Justice of the Peace. They heard disputes from community members on a range of matters, including those related to land disputes. Indigenous Pueblo governors may have also been involved in dispute resolution. In Senecú, due to the lack of cultivable land, the “vecinos” (“citizens of the pueblo”) wanted to use certain land set aside for the indigenous of the pueblo. This instigated a major dispute between the vecinos and the indigenous of the pueblo. Years into the conflict, the vecinos complained that the lack of cultivable land created severe poverty and suffering for them. The parties likely reached a temporary compromise, but as explained below, the lack of resolution contributed to some of the vecinos petitioning to move to Doña Ana. Based on preliminary research, the Justice of the Peace system was established in Doña Ana and nearby villages before and during the American occupation. Even former U.S. soldiers sought resolution through the system. Desperate Conditions. Due to the scarcity of land and rising community tension, in September 1839, a number of families in the Paso area petitioned local authorities for permission to establish a village at Doña Ana. Doña Ana was a well-known encampment fifty miles to the north of Paso along the Camino Real. Based on preliminary research, many of the petitioners were originally from the Chamizal neighborhood of Paso, including the main signatory of the petition, Jose Maria Costales. With the support of the Prefecture of Paso, the petition was directed to the Governor of Chihuahua, who directed it to members of the administrative assembly. Recognizing that the petitioners had “not a single piece of land to obtain their subsistence,” an administrative board recommended that the land be granted to the petitioners. The petition, however, was then delayed for over seven months in the administrative assembly before it was sent to the State Geographic Board in July 1840. Despite the urgency of the matter, the delay in processing the petition stretched out further due to bureaucratic intransigence. Eventually though, the Director of the Geographic Bureau drafted and forwarded to the Secretary of State preliminary regulations to grant the lands of Doña Ana to individuals in the Paso district. These preliminary regulations, however, did not concern only the granting of land. The regulations would require that all male civilians of Doña Ana, who were capable of bearing arms, present themselves “armed” whenever called upon by political or military authorities. Upon review of the matter, the Secretary of State provisionally approved the regulations and issued an order on July 3, 1840 to grant lands in Doña Ana to the petitioners, on the basis that a new settlement would “remove [the Apaches] farther off ….” Essentially, the Secretary’s order, the preliminary regulations and the re-petition all contemplated — not only the founding of a village — but also the establishment of a civilian guard for Doña Ana. The Governor of the State of Chihuahua finalized the Secretary’s order with an “ultimo” and arranged to have circulated a notice to the Prefects in his jurisdiction inviting “honest and industrious poor citizens” to settle the new colony of Doña Ana. The Governor’s circular was posted in many pueblos in the Paso area. The inhabitants of Pueblo of Senecú, for example, used it to frame a rather interesting petition. On the ground of extreme poverty due to the lack of cultivable land, thirty-two vecinos of Senecú petitioned for the right to use certain lands set aside for the indigenous of the pueblo. In the alternative, they asked to be granted land in Doña Ana. In their petition, they complained that the indigenous had “great antipathy” and “selfishness” toward them, which suggested that life in Senecú had become very stressful. It should be noted that at least a few of the petitioners and petitioner’s wives were actually descendants of the indigenous of the Pueblo of Senecú. Clearly, the dispute between the “indigenous” and the “vecinos” regarding the use of land in Senecú remained unresolved. However, the Governor rejected the request of the vecinos of Senecú to use indigenous land. He advised them to settle in Doña Ana. Months later, more men settled in Doña Ana. The increase in their numbers, however, offered little protection. The attacks by the Apaches continued. In April of 1843, twenty-six inhabitants of Doña Ana begged the local Paso government for arms and ammunition to defend themselves. Although the Paso authorities acknowledged a “constant and disastrous war” with the Apache, they agreed to provide only eleven muskets, but without any ammunition “as there is none, without drawing upon the garrisons.” Eventually, seven “auxiliary” infantry soldiers from Paso were dispatched to Doña Ana. By October of 1843, only fourteen residents were living in Doña Ana. Although they realized a “fair crop of corn … beans, cotton and other garden items,” they remained “in danger of losing their lives by the repeated threatnings of the Apaches.” Early the following year, the population of Doña Ana grew and land was officially distributed to sixty-eight households. On January 25, 1844, the population of the village consisted of 107 men, 59 women, 48 boys and 47 girls. The first local officials appointed in Doña Ana were the Justice of the Peace and Alternate Justice of the Peace. The villagers created inter-familial alliances and networks of support. Yet, everyday life in Doña Ana continued to be infused with violence and the imminent threat thereof. In the summer of 1846, the U.S. Army invaded New Mexico and thereafter occupied portions of the northern part of the New Mexico territory, principally the village of Santa Fe. By September of that year, an advance party of U.S. troops reached Doña Ana. The Doña Ana villagers, led by their Justice of the Peace, detained the soldiers and arranged for them to be taken to Paso, where they were arrested. This act by the villagers was bold and courageous, particularly in light of the fact that the Governor of New Mexico and his troops did not provide much, if any, resistance to the U.S. troops in Santa Fe. Some of the U.S. troops marched south to Paso and then farther south into Mexico to engage in battles with Mexican soldiers and civilians. Others stayed behind in Doña Ana as an occupying force. From time to time, the occupying force was rotated, with fresh troops arriving and others retiring. In November of 1848, for instance, an additional group of U.S. soldiers was sent from Santa Fe to New Mexico for the purpose of insuring “tranquility on the part of the inhabitants, and hold all marauding bands in check.” While most of the soldiers lived in Doña Ana temporarily, some of the soldiers — many of whom were immigrants from Ireland, Germany and Poland — settled permanently in Doña Ana. Even with the U.S. troops occupying the village, Doña Ana was attacked on a frequent basis by Apaches. One day in early February 1850, a group of Apaches captured two village boys and later that night stole 23 head of oxen. Days later, as Army personnel watched, Apaches raided the village again, wounding four herders, killing another, and taking another boy as captive, before the troops gave chase. The principal tasks for the U.S. military in Doña Ana were to ‘insure tranquility of the part of the inhabitants’ (to keep them in check) and guard the nearby copper mine and related property. If the Apaches attacked an American or threatened American mining interests, the Apaches were pursued. Otherwise, it was not a significant concern for the U.S. troops to protect villagers in Doña Ana from Apache attacks. The villagers most likely recognized this. Preliminary research indicates that one of the strategies of the villagers was to absorb the occupiers into their village. Many of the village men made lasting friendships with some of the soldiers, who would themselves become villagers. Some of the women of Doña Ana married immigrant soldiers, particularly if the soldiers were Catholic. After the Treaty of Guadalupe Hidalgo, the village of Doña Ana would be situated on the U.S. side of the border. Between 1849 and 1854, the Rio Grande dramatically changed its course. In 1849, flood waters overtook much of the Pueblo of Senecú. Most of the villagers of Senecú fled, with a majority of them moving to Doña Ana. Thereafter, due to the strain on the village from new arrivals, many of the villagers chose to reconstitute themselves in nearby Mesilla. Others moved to Mesilla because they wanted to be on the Mexican side of the border. Before 1854, the river changed course just south of Doña Ana near Brazito. Because the U.S.-Mexican border in this region was largely defined by the Rio Grande, much of the Doña Ana Sphere would remain contested space for years. See generally, David J. Weber, ed., What Caused The Pueblo Revolt of 1680 (Bedford/St. Martins 1999). See also, Correspondence of Domingo Jironza Petriz de Cruzate and related materials, 1682 (Archivo General de la Nacion [AGN], Vol. 37, ff. 142-208). The jurisdiction of Paso del Norte or Paso is now referred to as El Paso/Juarez. The Paso jurisdiction was within the Province of New Mexico during the Spanish colonial period. In 1824, after the Mexican Independence, the Paso district was under the jurisdiction of the State of Chihuahua. By the early 1800s, the separate “partidos,” precincts or neighborhoods within the Pueblo of Paso included Playa, Chamizal, Centro, Barrial, Calavaras, Charco, Alamos, and Alamo Gacho. See, e.g., 1806 Census of Schools of the Paso Jurisdiction, Nuevo Mexico, at Spanish Archives of New Mexico (SANM) 1621-1821, Reel 16, ff. 194. The indigenous Piro of the Pueblo of Senecú, for example, re-established their pueblo just south of the Pueblo of Paso. Their reconstituted community was called Senecú del Sur (Senecú of the South) or just Senecú. Timmonds, El Paso p. 36-37 (citing 1751 decree of New Mexico Governor Don Tomás Vélez Capuchín). As reported by a visitor to the area in 1754, the indigenous of the pueblos of Senecú, Ysleta and Socorro cultivated vineyards, corn, wheat and gardens. Timmonds, El Paso, p. 37 (citing 1754 report of Father Manuel de San Juan Nepomuceno y Trigo). This vast region included the Province of Nuevo Mexico (New Mexico) and Nuevo Viscaya to its south. See e.g., 1769 Mapa de la Frontera by Jose de Urrutia (available at Library of Congress Geography and Map Division). See, e.g., Correspondence dated October 3, 1707 from Joseph Chacon Medina Salazar regarding invasion of the Paso area by Apaches and request for help (SANM 1621-1821, Reel 4, 48-61; Letter dated December 23, 1806 from Ysidro Rey to Governor Joaquin del Real Alencaster reporting Apache raid on the Pueblo of Senecú del Sur (SANM Reel 16, ff. 0300). Sacramental Books of the Church Nuestra Señora de Guadalupe, Paso de Norte, 1700s-1800s (listing persons described as “Apache,” “Apacha” or “Indio de Nacion Apache” at baptism, marriage and death.) On July 31, 1765, four children described as “hijos de padres gentiles de la nacion Apache” (children of gentile parents of the Apache Nation) were baptized; their padrino (godfather) was a captain of the local presidio (garrison). Baptism Book, Nuestra Señora de Guadalupe, 1760-1755, image 147. Many Apaches listed in the Sacramental Books of Nuestra Señora de Guadalupe are listed as “criada” servants, which indicates that they lived in the household of the persons they served. See e.g., C.L. Sonnichsen, Pass of the North: Four Centuries on the Rio Grande, pp. 73-87 (Texas Western Press, 1968). 1849 correspondence from Senecú (Mary Taylor Papers (MTP), Box 20, Folder 4, Rio Grande Collection, New Mexico State University). See Timmonds, El Paso, p. 41 (Texas Western Press 1990)(citing 1766 Spanish colonial map by Jose de Urrutia). Reportedly, in 1815, one flood in Paso swept away a bridge. Timmonds, El Paso, p. 59. Records indicate that a bridge completed in 1800 in Paso may have been rebuilt at significant cost and effort. Correspondence of Spanish military personnel at Spanish Archives of New Mexico, Volume II (SANM), Reel 14, ff. 632 and ff. 892-894, 908-911, 984. “Today, the flow of the Rio Grande is controlled by a series of upstream dams, of which the largest and oldest is the Elephant Butte Dam completed in 1916 by the U.S. Bureau of Reclamation.” Charles Turner, et al., “The Challenge of Balancing Water Supply and Demand in the Paso del Norte,” in Susanne Michels, ed., The U.S.-Mexican Border. Environment: Binational Management Planning, p. 202 (San Diego State University 2013). The upstream dams dramatically changed the environment Paso. Id. This inter-community migration is evident in the church records of the pueblos of San Lorenzo and Senecú. See Timmonds, El Paso, p. 74. The Justice of the Peace also handled administrative matters for his locality. In Paso at this time, the designation of “vecino” was used for persons of Spanish ancestry and mixed ancestry. The term usually meant “citizen of the pueblo.” The vecino distinction implied that a person had certain rights and responsibilities. Vecinos were usually entitled to use and enjoy common areas and resources of their particular communities. They also had the shared responsibility to maintain and defend their community. Petition from Residents of Senecú dated October 10, 1840 (incorporated into Executive Documents of the Senate of the United States, 43rd Congress, pp. 55-56). It may have been possible, for instance, for the vecinos to lease part of the lands of the indigenous for cultivation. Petition to Settle Doña Ana (with list of petitioner names) dated September 18, 1839, incorporated into Executive Documents of the Senate of the United States, 43rd Congress, pp. 42- 44 (1874). Letter dated October 18, 1839 from Paso Prefecture and Letter dated November 9, 1839 from Governor Jose Maria Yrigoyen, incorporated into Executive Documents of the Senate of the United States, 43rd Congress, pp. 44. Letter of Pedro Olivares and Juan Negrete, incorporated into Executive Documents of the Senate of the United States, 43rd Congress, pp. 44-45.
 Letters dated October 18, 1839 from Jose Ygnacio Ronquillo and Pedro Trujillo, Prefecture of Paso District, and letters of Pedro Olivares and Juan Negrete dated December 5, 1839 and July 8, 1839, incorporated in Executive Documents of the Senate of the United States, 43rd Congress, pp. 44-45. Re-Petition for Lands in Doña Ana dated July 3, 1840, incorporated in Executive Documents of the Senate of the United States, 43rd Congress, pp. 50-52. A few additional civilians appeared on the petition, including Ramon Dias de la Serna, a member of the Paso government. Id. Letter dated July 7, 1840 from Jose Morales and Ramon de la Serna of Paso Prefecture, incorporated in Executive Documents of the Senate of the United States, 43rd Congress, p. 52. The Director in the Geographic Bureau made an initial determination that the petition did not request a “true colonization” because, as he explained, the petitioners sought only to relocate within the same district of Paso. He also had difficulty determining which particular colonization laws applied to the matter. Letter of Jose Rodrigo Garcia dated July 30, 1840, with attached preliminary regulations, incorporated in Executive Documents of the Senate of the United States, 43rd Congress, p. 45. Executive Documents of the Senate of the United States, 43rd Congress, pp. 48-49 (Letter dated July 3, 1840 from the Secretary of the State (Mexico) confirming that lands shall be granted in Doña Ana). Meanwhile, the Governor was calling on towns in the State of Chihuahua to assume the responsibility for their own defense. This policy, upon implementation, required civilians to provide for their own military companies, weapons and raise their own military funds. Rick Hendricks and W.H. Timmonds, San Elizario: Spanish Presidio to Texas County Seat, p. 57 (University of Texas at El Paso, 1998). Circular of Chihuahua State Governor dated August 13, 1840, incorporated in Executive Documents of the Senate of the United States, 43rd Congress, pp. 53-54. Absent from the Governor’s circular was any reference to Apaches. Instead, the circular included maxims, such as “if permanent felicity were compatible with human nature it should be sought in the fields,” and “[o]f all things that can be undertaken or sought in the world nothing is better, nothing more useful, nothing more sweeter or more worthy the free man than agriculture.” Id. Petition from Residents of Senecú dated October 10, 1840, incorporated in Executive Documents of the Senate of the United States, 43rd Congress, pp. 55-56. For example, based on my review of Senecú church records, petitioner Calixtro Leyva was the son of “Indios” of Senecu. Also, Placida Alejo (wife of petitioner Eugenio Lopez) was the daughter of Carpio Alejo, an Indio of the pueblo of Senecú. The surnames most usually associated with the Piro of Senecú were Alejo (Alexo), Cubero and Pedraza. Affidavit of Guadalupe Miranda, January 26 1846 (Mary Taylor Papers, Box 20, Folder 3). As one of the original settlers of Doña Ana, Guadalupe Miranda was granted land in Doña Ana. He eventually became the Prefect of Paso. Letter dated April 16, 1843 from Doña Ana Settlers, incorporated in Executive Documents of the Senate of the United States, 43rd Congress, pp. 71-72. Letter dated April 17, 1843 from Mauricio Ugarte and J. Dolores Madrid, incorporated in Executive Documents of the Senate of the United States, 43rd Congress, pp. 71-72. Roster of members of auxiliary company of infantry of Paso dispatched to Doña Ana, dated April 30, 1843, incorporated in Executive Documents of the Senate of the United States, 43rd Congress, p. 72. Letter dated October 30, 1843 from Joaquin Velarde and Jose Dolores Madrid, incorporated in Executive Documents of the Senate of the United States, 43rd Congress, p. 73. Statement of Inhabitants of Doña Ana dated January 25, 1844, incorporated in Executive Documents of the Senate of the United States, 43rd Congress, p. 81. Letter dated January 25, 1844 from Jose Dolores Madrid, and letters dated January 26, 1844 from Pablo Melendres and Jose Maria Costales, incorporated in Executive Documents of the Senate of the United States, 43rd Congress, p. 72. This research study will not focus on the motives and interests behind the United States invading New Mexico (and Texas) and starting the U.S.-Mexican War. That said, the main interest of the U.S. was the taking of land under the jurisdiction of the Mexican Republic. See generally, A Wicked War: Polk, Clay, Lincoln, and the 1846 U.S. Invasion of Mexico (Alfred Knopf 2012). Timmonds, El Paso, p. 93. Page from Diary dated September 21, 1847 by Phillip “Gooch” Ferguson, excerpted in Marching with the Army of the West (1936) (Mary Taylor Papers, Box 20, Folder 5). Letter dated November 8, 1848 from Lt. Colonel J.M. Washington to Secretary of War W.L. Macy (in U.S. House Documents, 31st Congress, 1st Session (1849). For a discussion of the interplay of the U.S. invasion of northern Mexico and the wars of the Apache and Comanche against the people of this same region, see Brian DeLay, War of a Thousand Deserts (Yale University Press 2008). Transcribed Letter dated February 10, 1850 from Officer Stuyvesant to his mother (Mary Taylor Papers, Box 20, Folder 6). See e.g, Transcribed Letter dated September 18, 1851 from Officer Stuyvesant to his mother (Mary Taylor Papers, Box 20, Folder 6). In a few instances, some of the marriages between villagers and soldiers were of dubious character, like the case of an officer marrying a twelve-year old village girl. See, e.g., Transcribed Letter dated July 8, 1851 from Officer Stuyvesant to this mother (Mary Taylor Papers, Box 20, Folder 6). By early 1849, Father Ramón Ortiz began organizing Nuevo Mexicanos for ‘repatriation’ to the “territory of Mexico.” Transcript (from translation) of Letter from Ramón Ortiz dated June 9, 1849 printed in El Faro on June 30, 1849 (Mary Taylor Papers, Box 20, Folder 5). Affidavit of Pablo Melendres, Jr. dated January 7, 1908, In The Matter of the Survey of the Hugh Stephenson or Brazito Grant, before the U.S. Department the Interior, General Land Grant Office. See also, Affidavit of Felipe Madrid dated March 21, 1907 (Mary Taylor Papers, Box 20, Folder 3). This is a research platform for Sonja Sonnenburg's Doña Ana Sphere Project. Research is ongoing. Articles will be posted here from 2014 to 2016 to provide the public with research updates. The content on this site is protected by copyright law.